Why are Lansdowne RFC top of the AIL Rugby table by a country mile with 49 tries scored – when nearest rival Clontarf have scored just 26? The answer could be 23 year old Craig Ronaldson. 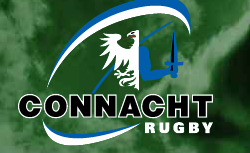 The league’s runaway top point scorer has now signed a contract that will bring him to Galway for Connacht next year. Despite the loss of coach Eric Elwood – new coach Pat lam arrived in Galway this morning – there is no doubt that the province is still thinking big.